Soi 38 is one of the events featured on my new list Pop-ups of Note. To see the full list, click here. Why have a food truck when you can have a food cart? 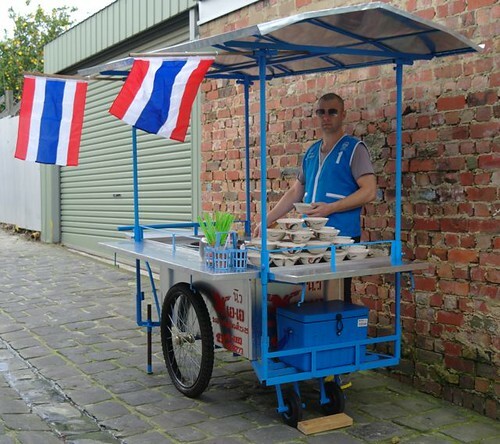 Andy and Tina from the Thai/Viet Melbourne food blog Krapow own a gorgeous little food cart, manufactured in the Bangkok suburb of Thonburi and imported to Melbourne for the specific purpose of introducing Melburnians some of the delicious Thai noodles dishes that aren't so well known here. The Soi 38 team includes Top, a Thai chef whose food at Appetizer and then Tidlom demonstrated his commitment to bringing more authentic Thai flavours to Melbourne. Having Andy and the other Soi 38 team members all sport blue Vin Vin vests, the kind worn by Thai motorcycle taxi drivers, is a lovely touch. 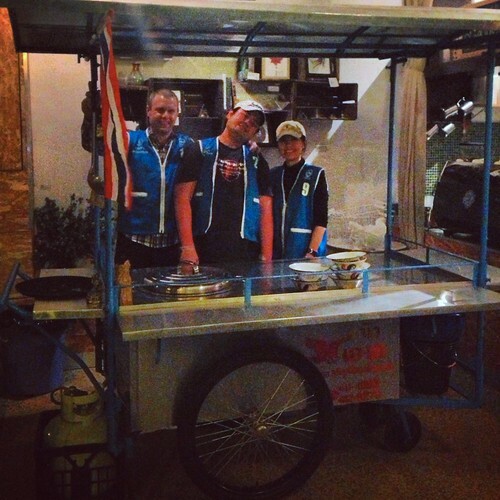 The Soi 38 cart has already popped up at a few street festivals, but starting next week on 19 July, Soi 38 will have a six week Friday night residency at North/West Melbourne cafe Sketch & Tulip. From 5pm each Friday night, they'll be dishing up $5 bowls of noodles (you'll want a couple of bowlfuls cos they're so damn good) and beers. Of course, each table will have khreuang puang (condiment caddies) containing fish sauce, white sugar, crushed dried chillies and chillies in vinegar, so that you can tweak your dish to your ideal calibration of hot, sour, sweet and salty. 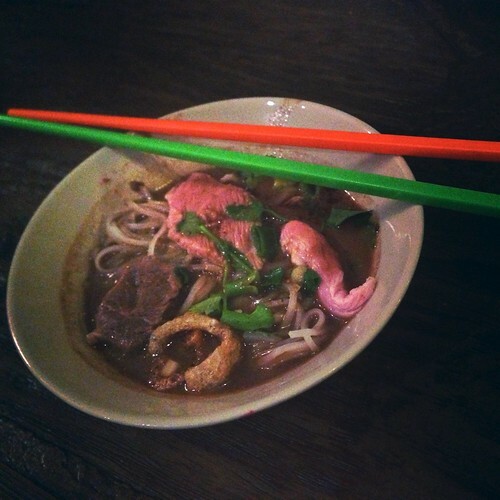 "Thai Boat Noodles (kwaytiao reua) are a delicious and intensely flavoured but little known traditional Thai dish. They are associated with central Thailand, and are so called because they used to be sold from small boats along the canals and rivers. These days the vendors have moved onshore and the most famous boat noodle restaurants are found in 'boat noodle' alley near the Victory Monument in Bangkok. Each bowl of Boat Noodles starts out with a mound of delicate rice vermicelli noodles and a scattering of water spinach and crunchy bean shoots. Added to this is a trio of gently heated sliced rump, tender braised gravy beef and a springy pork ball. The bowl comes to life with the addition of the complex broth exuding notes of cinnamon, soy, star anise, lemongrass, galangal and pandan and more. The finishing touches are then applied with a touch of garlic oil, a few sprigs of fragrant coriander, a sprinkling of finely sliced spring onions and some crunchy fried pork crisps. Thai Boat Noodles leave their more well-known South East Asian counterpart, Vietnamese Pho in their wake. 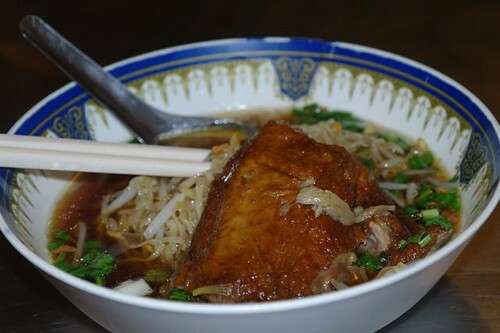 Unfortunately Thai Boat Noodles are just not very well known in Australia, it is my dream that Soi 38 will be one of the first small steps in changing that." Soi 38 is a charming labour of love by people passionate about Thai noodles, and I strongly encourage you to head down to Sketch & Tulip over the next six weeks. Further details can be found on the Soi 38 website and FB page. If you pay them a visit, be sure to wish Andy congratulations as Tina gave birth to their son on Monday! Happy New Financial Year! 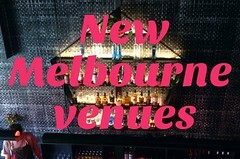 To celebrate, I'm sharing my reference lists of Melbourne hospitality venues that are going to open soon, or have recently opened. Links to further information, reviews and third party sources provided. As these are standalone pages that I'll be updating as new information comes to hand, my hope is that they'll end up acting as something of an historic timeline for Melbourne food and drink openings. Let me know what I've missed! 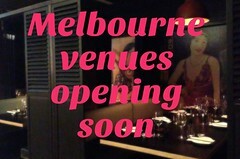 For the list of anticipated places opening soon, click here. For the list of places that have recently opened, click here.